Your annual gift provides discretionary monies to allocate to breaking opportunities and new initiatives. 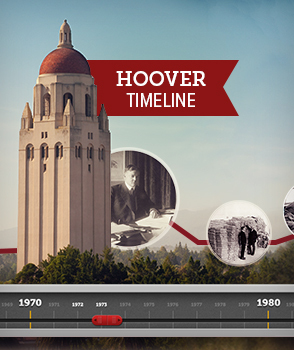 A pledge is a formal statement of intention to make a gift to the Hoover Institution. It may be followed by an immediate gift, or may confirm your intention to make a gift in the future. Many donors choose to fulfill their gift pledges by making regular payments over a specified period of time, giving them the opportunity to make a more generous gift than they may have originally considered. When possible, the Hoover Institution encourages full payment within three to five years of the original pledge. Many corporations match, or multiply their employees' gifts, up to a set amount. You may want to ask whether your employer participates in such a program, as well as to determine any restrictions that may apply to their matching gifts. A gift of long-term appreciated marketable securities can provide you with tax advantages as well as providing the Hoover Institution with philanthropic support. Hoover's Development Office can advise you or your broker about how to facilitate such a gift. Securities in a company that is not publicly traded are known as closely held securities. A gift of securities may provide the donor with significant tax savings. Planned gifts are gift arrangements that have specific tax advantages and often include lifetime income to a beneficiary named by the donor. Many Hoover Institution donors have utilized planned giving methods, enjoying such benefits as capital gains tax savings, increased income, and income-tax savings, while at the same time benefiting the Hoover Institution. A planned gift can maximize your giving potential and even allow you to ensure your future financial security or that of a loved one. For further information about making a planned gift, please contact Hoover's Office of Development by telephone at 650-725-6715, by facsimile at 650-723-1952, or by e-mail at development [at] hoover.stanford.edu. Your gift to the Hoover Institution can allow you to hold an interest in that gift for a lifetime, or for a specified period of years after which the funds become available to the Hoover Institution. For example, you can set up a charitable trust, which allows you or a beneficiary to receive income from that trust for a specified period, or for life. You can donate your home to the Hoover Institution while retaining the right to live in it for life. You may claim an income tax charitable deduction based on the full market value of the gift or eliminate certain costs associated with the transfer of real property when giving a home or real property to the Hoover Institution. Gifts of real estate can also provide an income to you.